The Pigeon Racers Of Indonesia : Parallels Racing requires a pair of pigeons. The male is the racer, and he flies back to the female during the race. But some Indonesian men love this sport so much, it's been blamed for a rise in divorce. 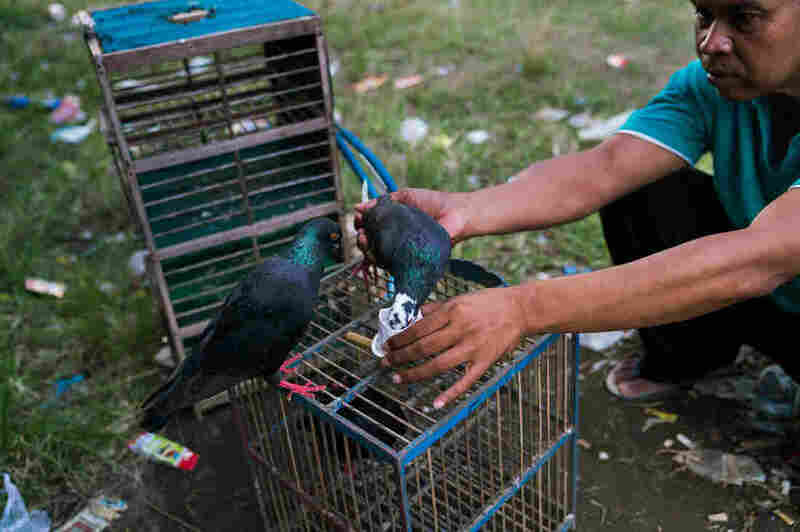 Ken Rapopo, 40, pulls two birds from the cage and holds them up in the air, one in each hand. He pulls his arms back, then flings the birds up. A split-second later, they spread their wings and start flapping. Ken Rapopo throws a pigeon in the air during a practice flight. This male pigeon will fly about 2 miles back to the winner's circle to find its female partner. Rapopo reports the bird's movements by walkie-talkie until it disappears from view. The two pigeons circle the field and Rapopo reports their movements by walkie-talkie. Suddenly one bird changes direction and flies in a direct line toward the goal, where his female partner awaits. He disappears over the trees and out of view. Back at the playing field, two men watch the sky, waiting for their birds to return. The men squat in the dirt, each with a female bird in one hand. Sometimes they spread the bird's wings and wave her up and down. When the male racer is close, they call: "Way, waaaaay!" Parno, one of the pigeon racers, gives his birds water from a tiny handmade paper cup. Since this is an aerial race, the finish line is four tall posts strung together with red streamers that form a box 20 feet in the air. A winning bird must pass through that box before landing in his owner's hand. 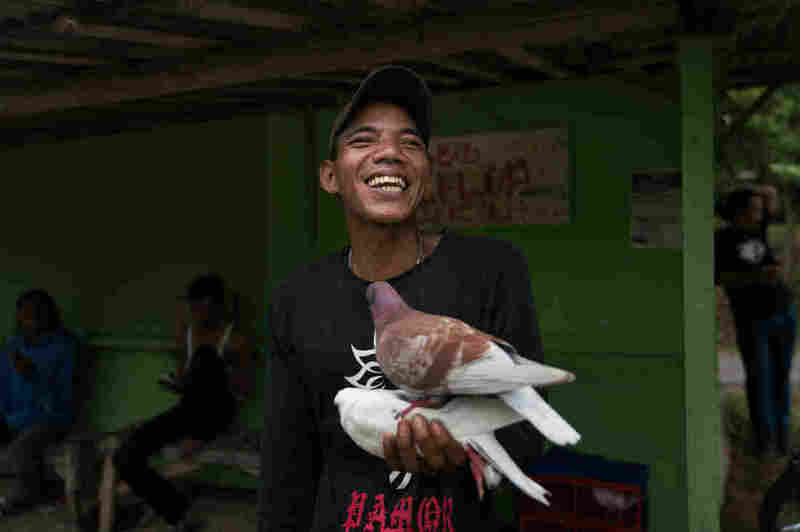 Pak Iskan, 50, is the first to walk away with two pigeons in hand — one male, one female. But he's not the winner. Speed isn't the only rule of this game. The bird has to make a perfect landing. "It's bad, bad pigeon," Iskan says, laughing. But he and the others clearly love their birds. Caring for them is an intimate business — giving each bird tiny handmade cups of water after a race, misting their feet with water, like a trainer in a boxer's corner. 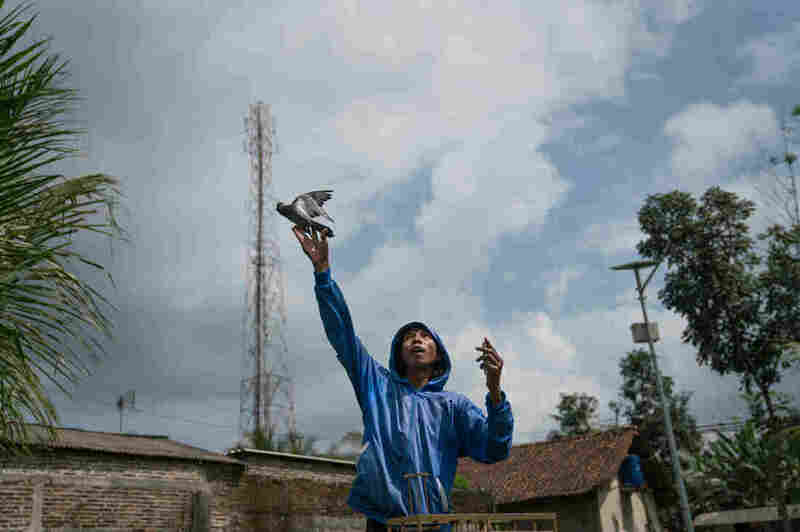 Just a decade ago, nationwide infrastructure improvement meant that police closed down a lot of Indonesia's pigeon racing. It used to disrupt traffic. Recently, the sport has grown in popularity — so much so that a slew of recent divorces have been blamed on some men's addiction to the sport. The men can spend full days, from morning to night, sitting outside, flying their birds, training them, betting on the winners. Some decoratively dye their birds' wings or build beautiful cages for them. And they give them unexpected names — like Jack Black. He's a special bird. A big winner. Someone offered 20 million rupiah — almost $1,500 — for him. His owner wasn't selling. Sumarjan is bursting with excitement after his one-year-old pigeon Panjol wins the day's race, earning him about $9. "This is my first time winning the competition," he says. "I'm so happy. This is only a small competition. I can't imagine winning a bigger competition." "Maybe if they have babies," he says, "maybe the babies I could sell."